This Cherry Almond Macaroon Pie recipe is filled with flavour. 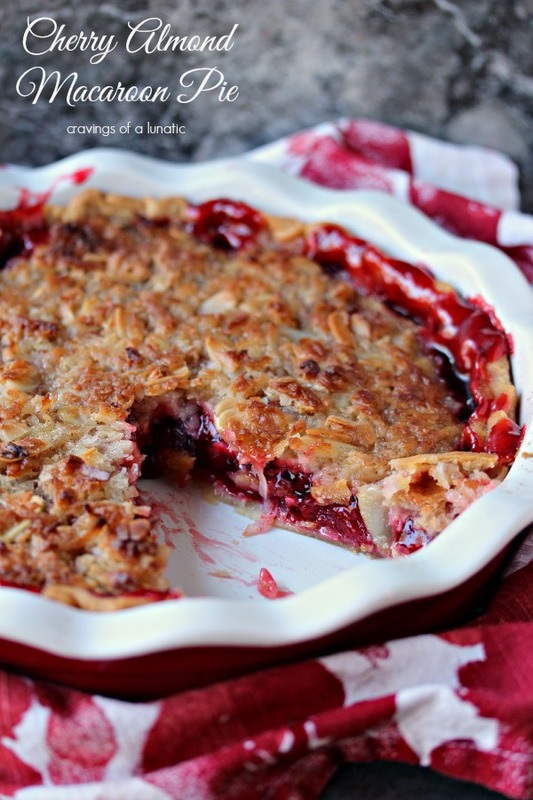 The pie crust is filled with cherry pie filling, then topped with almonds and coconut. It’s the perfect bite every time! I had eyed this recipe awhile back. I stumbled upon it on a food site. 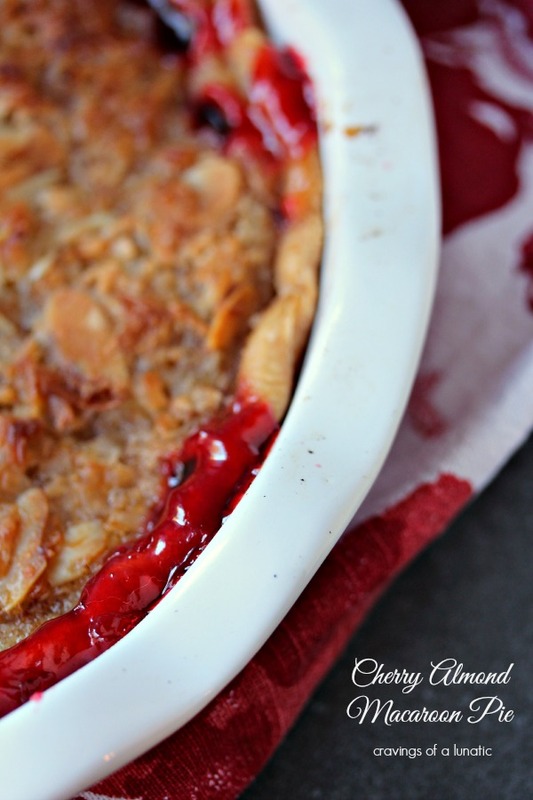 So kudos and acknowledgement go to the Pillsbury site for their recipe for Almond Macaroon Cherry Pie. This was the bake off winner in 1986 and the winner’s name is Rose LeMon. I just had to try this one. I only made one change to it. I added coconut extract to it. If I make it again I’d be inclined to lose the almonds. Not sure my hubby would be on board with that though. He’s an almond lover. I just loved it but think I would like it better with just coconut. But then I’m a coconut fiend, so there you go. So try the original, or try it without almonds, or try it without coconut. Just try it. Trust me, you will not be disappointed. Pie Dish– I find it useful to have multiple kinds of pie dish. I’m obsessed with them. If you can only buy one I suggest a great quality one like Emile Henry. If you’re on a budget buy a Pyrex pie dish or a good non-stick pie dish. If you’re looking for some fun and fancy I highly recommend The Pioneer Woman’s Stoneware Pie Dish. Mixing Bowls– Having good quality mixing bowls is incredibly important if you bake often. 3, 4 or 5 piece sets are great because they stack inside one another so they save space. I use my mixing bowls for everything from mixing to storing fruit and serving popcorn. Measuring Cups– This is something else I have multiples of. I have glass measuring cups, angled measuring cups, plastic measuring cups and metal measuring cups. Make sure you watch the recipe video for this Cherry Almond Macaroon Pie. Recipe video was added on November 13, 2017. Enjoy! This recipe is filled with flavour. 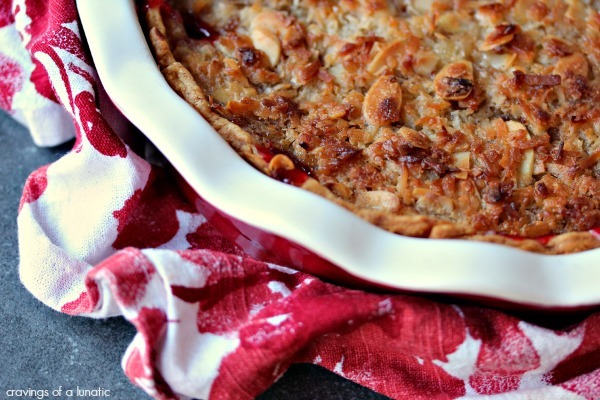 The pie crust is filled with cherry pie filling, then topped with almonds and coconut. It's the perfect bite every time! 1 package of Pillsbury pie crust you only need one of the two pieces. Carefully roll out the pie crust, then place in a pie plate. In a large sized mixing bowl combine all the filling ingredients together. Mix thoroughly. Spoon the mixture into the pie crust. In a medium sized mixing bowl combine all of the topping ingredients. Remove pie from oven at the 20 minute mark and spread the topping over it. Return to the oven and bake for another 20 to 30 minutes. The top should be golden brown when done. Serve with a big old cherry loving smile! Hope you love this. We sure did. 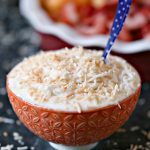 I am in love with any recipes that incorporate cherry with coconut. I’ve made cherry cake pops before which were amazing. I’ve also whipped up chocolate granola with dried cherries, almonds and coconut. I’ve also made coconut whipped cream and cherry parfaits. Love those way too much. Any chance I get to put them together I jump at. This recipe was totally worth the leap of faith. Jump in and try it yourself. If you’re looking for more dessert recipes be sure to check out my recipe index. You can also find easy dinner recipes as well. Kim, I love the combination of cherries, coconut and almonds. All my favorite flavors in one pie! This is delicious! Thanks for sharing!! Hi Kim! Thanks for stopping by my blog. 🙂 Cherry pie! I just went cherry picking and anything cherry is very tempted. 🙂 Your pie looks delicious and I like the addition of coconut (my favorite!). Thanks Nami. I loved it. I may do a different take on it on the weekend. Love cherries, I could just eat a pound a day. It's the perfect fruit. Hey, thanks for the add on Food Buzz! Look forward to sharing recipes with you…love meeting other bloggers who love food just as much as me! Thanks Charissa. This was one yummy dessert. Glad to have another foodie friend. Slowly figuring out how food buzz works. Been fun seeing everyone else's creativity. I saw the word macaroon and was hooked! Your site is so inspiring and well done. I really look forward to seeing more of your creativity! Aw, that's really sweet of you Paula. I still feel so out of my element. Some of these bloggers are super skilled with photos and gourmet food. If you like macaroons scroll back to march and check out mike's macaroons. They are chocolate macaroon cookies that take under 10 minutes to make. Great looking pie! 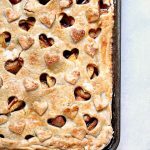 Love that you used a store bought crust! Glad I am not the only blogger out there who doesn't always make my own! You had me at coconut. And cherries. And almonds. Oh, let’s be honest, you had me at PIE!! Oh my goodness! 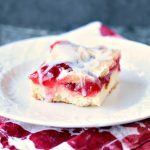 Such a beautiful pie and I love the cherry/coconut combo! A delicious combination! It may be an oldie, but it sure is a goodie! Nice pics! Love, love, love the cherry almond combo – and macaroons are an awesome idea. I can’t remember if I’ve ever used coconut with cherries, but I’m totally wanting to try it now. Beautiful! What a great pie!! My mom would go absolutely nuts for this one! I am going to have to find a reason to make it for her next time she visits. She isn’t a big dessert person, but this combines everything she loves! yummy!!! I love Cherry and anything! Coconut looks amazing! Cherry and almonds are my favorite combination! Love this topping on that pie. Such a great flavor combination! Gorgeous photos! Love this!! I am a true coconut fiend, so I’d love to see this one with just coconut. Then I’d like to plant my face on it. Because. Coconut, yo. I’m with you on the leaving out the almond part. I think the extract would be great enough when combined with the cherries. Damn, that sounds good. Macaroon pie?! How come I’ve never heard about it. Genius! I agree on hubby! 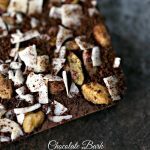 More almonds less coconut 😉 That’s just personal taste haha but this looks awesome! Shared on social and pinned for later! Nice recipes deserve some attention. Did you use sweetened coconut flakes? Hi Debby. Yes, use sweetened if you can find it. Basically, any coconut will do in this recipe. It’s one of those recipes where you can mix it up a bit and it will still turn out amazing. Let me know if you have any other questions. Have a great day. Hi, it looks yummy but just wondering: in the video the milk you pour looks more like evaporated milk… what kind are you using?Thanks! Hi Sue. I use 2% for this recipe. Hope that helps. 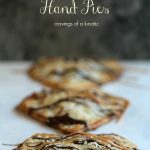 I have tried to Pin this recipe and I get a message that something went wrong on “their” (your) end. Please fix it I& possible! The recipe looks really good! Hi Sheila. Not sure why it was acting up. Could have been the holiday traffic crashing things. Hope you were able to make this over the holidays. Thank you for getting back to me on my past comment of not being able to pin this recipe to Pinterest . I was able to do so today. Hi Sheila. I’m so happy you were able to pin. Never hesitate to reach out to me. I’m a professional pie baker and this one caught my eye. Now normally I make my own pie fillings, but a local store had the canned stuff for $.99, and you can’t beat that for certain desserts. Anyways, we were looking at the video and both commented that we would use 2 cans of filling. Was one truly enough or would the 2nd can make it even better? Hi Donna. Thanks so much for commenting. I used one can of pie filling for mine. In Canada the pie filling cans are 540 ml which is about 20 ounce. I think the U.S. cans are 21 ounces. I loved the ratio of pie crust/filling/topping in this one. I think if you used two cans the cherry would overwhelm the macaroon topping. That said, if you love cherry pie filling then you should give it a whirl. I think it would still be amazing with two cans. It’s all about personal taste so I’m all for adapting recipes to make them your own. Let me know how it turns out. You are right. 2 cans are a bit much, though not awful by any means. I think 1 1/2 cans would be perfect. My daughter’s boyfriend said it was the best pie he’s ever had. He gets to try lots of different pies from me….willing taste tester. I didn’t put the nuts in the topping because too many people either are allergic to nuts or don’t like them. Hi Donna. I’m so glad you all liked it. It’s a pretty incredible recipe. You should try it with blueberry filling next time. Really good! You are so right. Nut allergies are definitely something to be careful with. So many people are allergic to them. Let me know if you try it with a different filling. 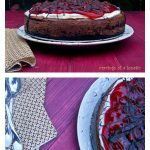 I think it would be amazing with peach filling too! I froze a bushel & a half of peaches from the farm stand I bake pies for during Aug & Sept. I think you are right, it would be amazing. I’m a diabetic (God has a wicked sense of humor) so I will need to find a guinea pig or two willing to be my taste testers. LOL! Hi Donna. I wish I lived near you because I would totally volunteer to taste test that for you. I don’t have fresh peaches but maybe I’ll try making this with frozen peaches this weekend and see how the kids like it. Hi Cathy. I don’t calculate it myself, it’s a plugin that calculates the info based on ingredients and serving sizes. I highly recommend anyone who has to follow a certain diet calculate it themselves, just in case. There is just too much room for error. I’m not a carb counter myself but I know some people really need that info so thanks for the heads up. I’ll run the numbers in the plugin again this weekend and see if it corrects itself. I have made this pie three times and making it again today for Thanksgiving lunch tomorrow. It is delicious, delectable and divine!!! Everyone that has tasted it says how yummy it is. Thank you for giving me this recipe to delight my family and friends with. Happy Thanksgiving to you and yours. Hi Joanne. Sorry to see this so late. I took way too much time off over the holidays. Ha! I an so happy you love this recipe. Stay tuned for some new versions of this winter and spring.